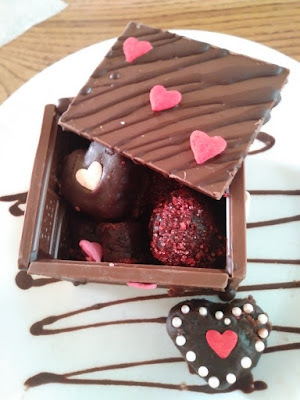 Home / Columns / Daily Update / Features / Natilie Cavnar / Normal Chef / Top / NORMAL CHEF: Brownie bites in a chocolate box. Valentine's Day, a day of love, romance, flowers, and candy. This time lets make the candy for our special someone. I am going to keep this super simple and easy to do but oh so delicious. The best thing about it is being with the one/ or the ones you love the most. Brownie bites in a chocolate box. 1 container of your favorite brand chocolate icing. After brownie mix has cooled, crumble it into a bowl, add enough of the frosting out of the container to make your brownie mix into cake balls. Its a different amount amount depending on the brand frosting you buy and what type of brownie mix you make. So I always start with 1/3 of the container and add more if I need it, until I can easily shape it into a ball and it holds it shape. Save the rest of the frosting. Now make your balls, you want them bite size or 2 bite size if you are going to put them in the chocolate box. I also had small heart cutters that I pushed some of the mix into and then pushed them out. Once all shapes are done but in the fridge for 30 minutes to hold there shape better and make them easier to cover. I took some of them and rolled them in red sugar, or you could do chopped nuts, coconut, or mini chocolate chips. The others I covered with the left over frosting that I heated up in the microwave until it was pourable. Start at 20 second intervals because each microwave is different. You just want to be able to pour it and cover the bite, scrap up the drips and put it back in the container and melt again as needed. Decorate your brownie bites as you like. If you have a rack put the bites on the rack and then cover the brownies. Once all covered put them in the fridge so they can set up. Now onto the box. Break all the chocolate bars in half, and lay the pieces out, with the flat side facing down. One piece is for the bottom, and then you want to "glue" the other chocolate pieces to it. For this take some chocolate almond bark, or chocolate chips and melt them down to use as your glue. You can glue them on, one of two ways, you can put the melted chocolate into a bag and pipe it on the edges and press it on the side that you are gluing, or you can hold the piece of chocolate up against the base and use a spoon and just drizzle a trail of chocolate to adhere the 2 pieces together, and then do the samething as you adhere the sides together. Once is all glued together, let it set for 15 minutes to firm up. Then fill your box, place on a special plate or put it in a little box, fill it and give to your loved one. Now you don't have to fill it with brownies, you can put their favorite candy in it, cookies, or even mousse. If you bought your Valentine a piece of jewelry, put some tissue paper in thier, place the jewelry in there and put the lid on and give it to your Valentine. Happy Valentine's Day everyone.